As you head into the new year, you probably have some resolutions about changes you want to make in your life or style of living. A great resolution to have for the new year is going green and trying to adapt more environmentally friendly ways of living. As a society, we tend to take the earth, its resources, and beauty for granted, but these are things that cannot last unless we start living in a more sustainable, environmentally friendly manner. 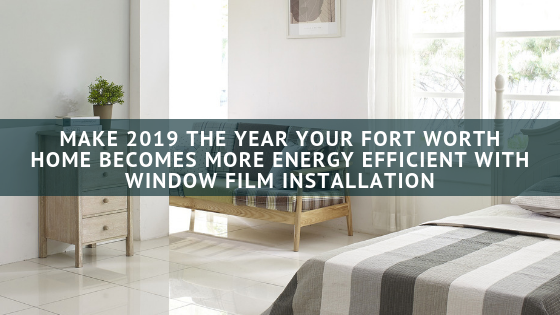 By installing window film for your Fort Worth home, you can start the new year off in an eco-friendly, responsible way and save money on energy costs. Window Film vs. Window Replacement: Which Is More Eco-Friendly? If you’re looking into ways to make your home more energy efficient, you’ve probably come across many articles that suggest replacing old windows. Window replacement can be an effective way to improve the performance of old or outdated windows, but it’s also important to look at the cost and the environmental impact of this option. Replacement windows are expensive, so often the more affordable option is to retrofit existing windows with window film. Window film is also considered a more eco-friendly option as well since there is less material waste. New products often have a bigger impact on the environment because they require packaging, transportation, and installation. Retrofitting existing windows with window film has less environmental impact since less materials are wasted and fewer greenhouse gases as produced in the process. Installing window film can have significant impact of the energy efficiency of your Fort Worth home. Windows are one of the leading causes of energy loss, accounting for a total of up to thirty percent. By installing window film, you can prevent your Fort Worth home from wasting precious energy and save money. On average, homeowners are able to trim down their energy expenses by one third once they have window film installed for their home. This results in a quick ROI of only three years. Go green for the new year by installing energy efficient window film for your Fort Worth home. Call today to get an estimate on installation services.